As I watched volunteers ‘plant’ ceramic poppies into the grassy moat, I felt her devastating loss, as must the other families represented in the 888,246 poppies. 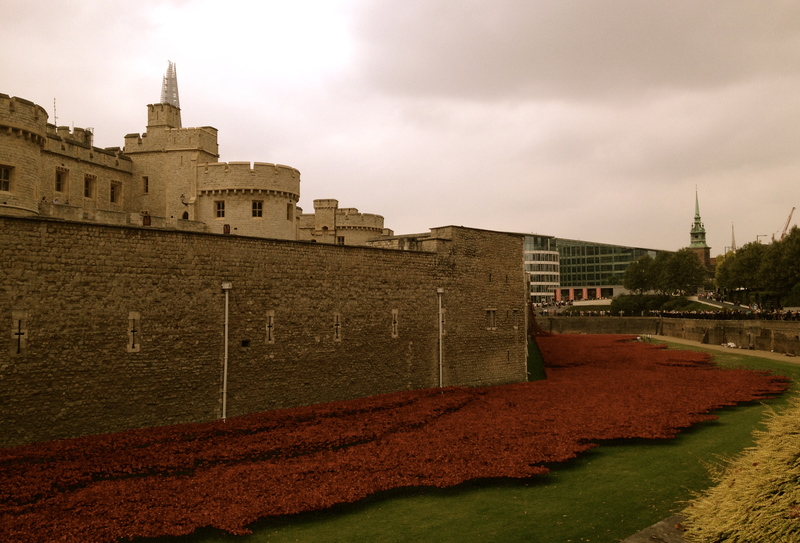 The artistic installation entitled ‘Blood Swept Lands and Seas of Red’ filled the Tower’s moat, creating a powerful visual commemoration for the First World War Centenary. Each poppy symbolizes the life of a British or Commonwealth soldier, like that of Sarah’s young husband killed in France. 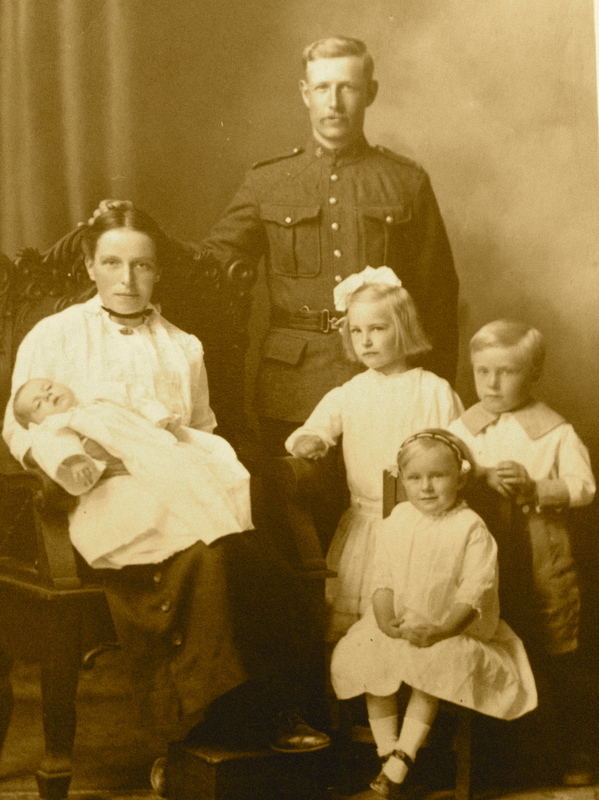 It was 1916 and the young widow was left to raise their four young children alone; Sarah was my father’s grandmother. 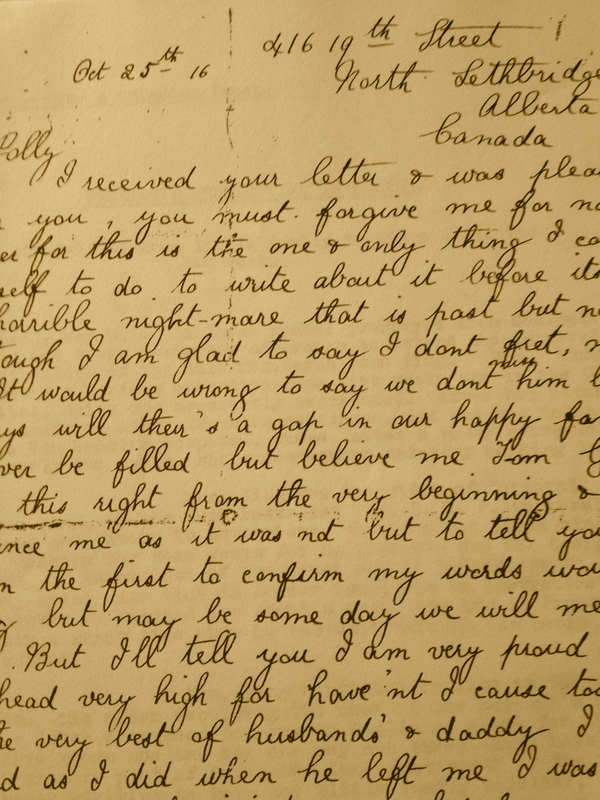 Her letter penned only two months after William King’s death, reveals a loving, brave young woman. I wish I could have known her. Sarah would soon learn that William had died from a sniper’s bullet as he dug trenches; those muddy, rat infested warrens that offered scant protection for the front line troops. She would receive a cloth game of checkers that was found in her Will’s front breast pocket when he perished; his blood staining the centre of it. I like to think that it was a comfort to her, holding something of his that had been with him at the end. I also imagine the desire for her to return to her family in England must have been overwhelming at times. She wrote, “I don’t know what I shall do yet, but I shall not come back to England to stay, for Will took every precaution to leave us comfortably provided for in case of him being hurt or killed. It would be silly to wave it all on one side.” She seemed resilient and practical, all the while ensuring her husband’s efforts were not abandoned in death. Despite her grief, Sarah wrote that she hadn’t been against William going to war if he wanted to and that “someone must step in to defend the atrocities, we would find it difficult if no one came to our assistance.” Even with her loss she was able to reconcile the sacrifice, as so many women were forced to do during the First World War. Women suddenly joined the workforce; they became munition workers and bankers, took over the fields and shops, drove trucks and became postmasters. They had no choice but to join the war effort, urged on by Queen Mary’s appeal to the ‘Women of the Empire” which urged all patriotic women to do their part in the war. She encouraged women of all ranks and ages to unite for the cause in the Mother Country and the Empire. Women’s participation in the paid workforce between 1911 and 1921 increased dramatically as they learned trades and skills. Widows like Sarah were often thrust into challenging new roles, while also having the daunting task of raising their children as single parents. I find it remarkable that these selfless sentiments were written only two months after her husband’s death. I picture Sarah busy with her four young children, able to reconcile her situation as she went about her daily tasks. The loneliness of the evenings however must have weighed heavily, and I suspect she spent many of those nights darning, knitting or stitching. 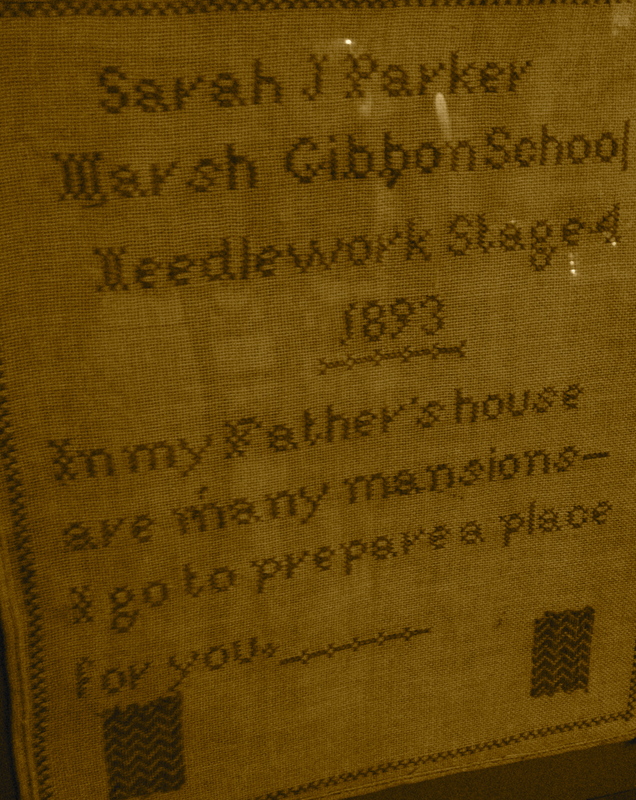 She was a cross stitcher above all, a skill she learned at the age of eight as her sampler* stitched in 1893 declares. Her name, Sarah Jane Parker, is stitched proudly at the top, followed with a prayer. It is proudly displayed in my parents home, brought with her Sarah when she boarded the ship that carried her to a new life in Canada. Perhaps it was stowed in her steam trunk with the expectation of it decorating the bride to be’s new home. 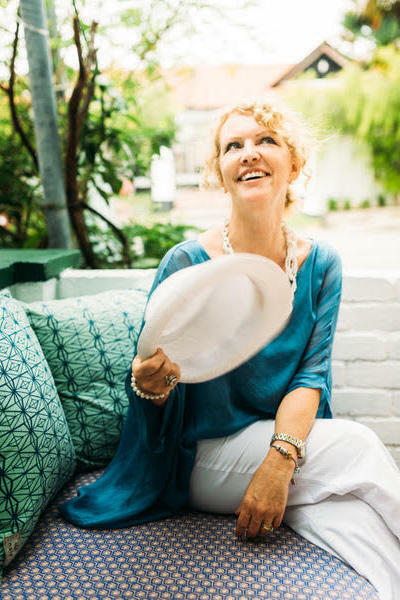 Her love of this craft was passed on to her daughters including her youngest child Sadie, my grandmother, who has also left a legacy of beautifully stitched works. What Sarah couldn’t know at the time of William’s death was that her youngest, Sadie, would one day marry a man twenty years older. 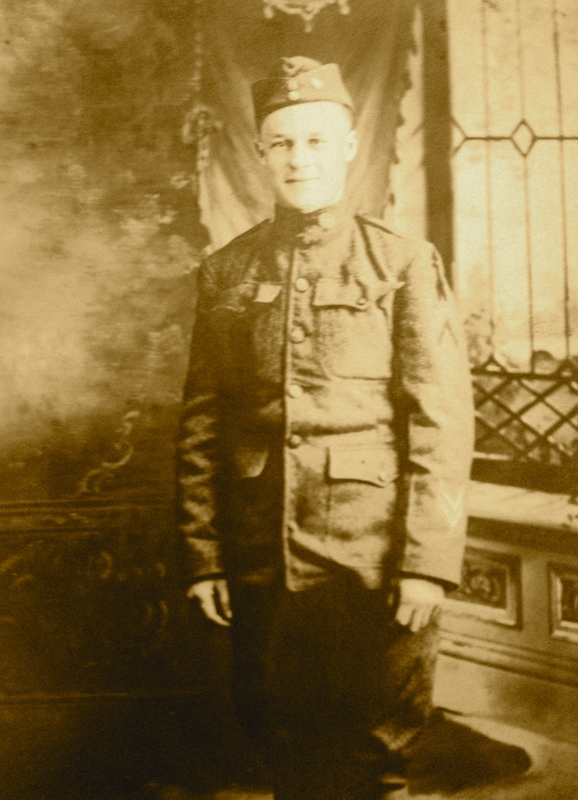 This man had fought in the same war as her father and it’s extraordinary to me that both my father’s grandfather and father, Albert Campbell, fought in World War I. Only one came home. 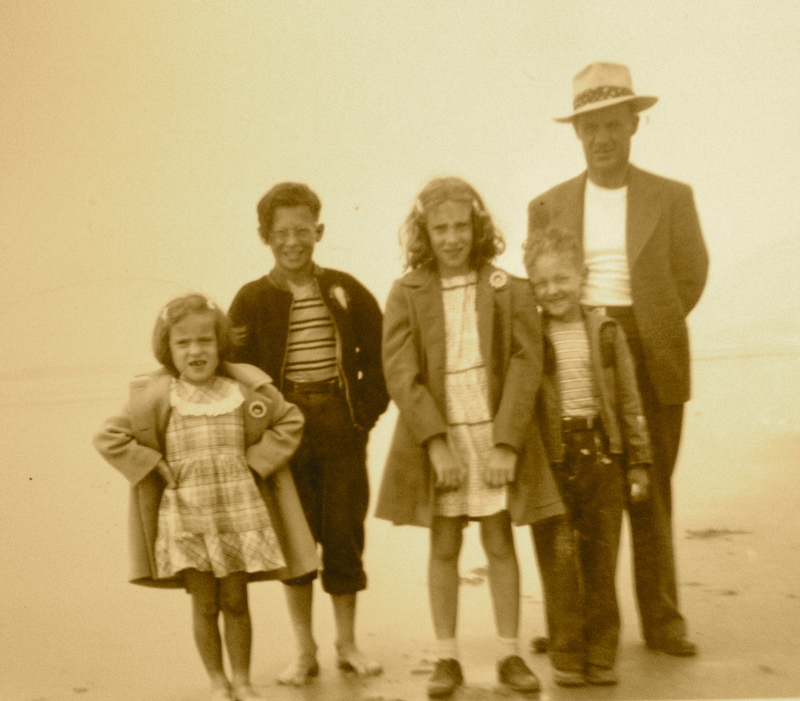 Through the bravery shown by Sarah, her children had the love as if of two parents. Sadly however, that would be short lived. Sarah’s letter is one of many written archives that live on, as well as countless poems from that time. I’ve come across a young Canadian woman Phebe Florence Miller, a poet and postmistress from Newfoundland. During a long artistic life, she wrote many poems that capture the tragedy of the ‘Great War.’ Her poignant verse captures the courage, hard work and stoicism of many women. She echoed Sarah’s words when she wrote..
Can we have lived through it all? Or was it some dream we dreamed? Gleaming memorial shafts give us our answer. 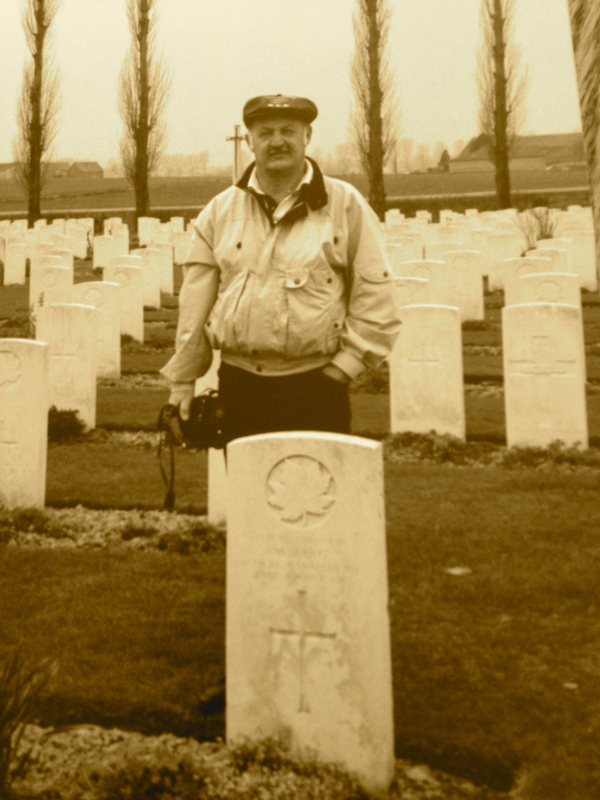 My father, Curtis King Campbell at William’s grave in Ypres, Belgium. Those Memorials exist in almost every Canadian community and ask us to stop and remember, to respect the sacrifices. My parents have visited Yperes, Belgium, where William King was laid to rest. Every evening since that war’s end, a bugle mournfully calls out to honour the fallen. Sarah did not visit nor her children, yet I know my parents felt the weight of all the loved ones they represented as they stood at Corporal William King’s war grave. I felt it as well as I gazed out over that ‘sea of poppies’ in London, knowing a family member was represented. I’ve since claimed one for the family…one of the almost 900,000 ‘remembrances’ that have been boxed up and shipped out to the ‘Colonies’. It will be a remembrance in my parent’s home…a tribute to that handsome young man who gladly answered the call of duty to King and Country. *A sampler is a stitching that was common for young girls to undertake at school, teaching them the skill of cross stitching.